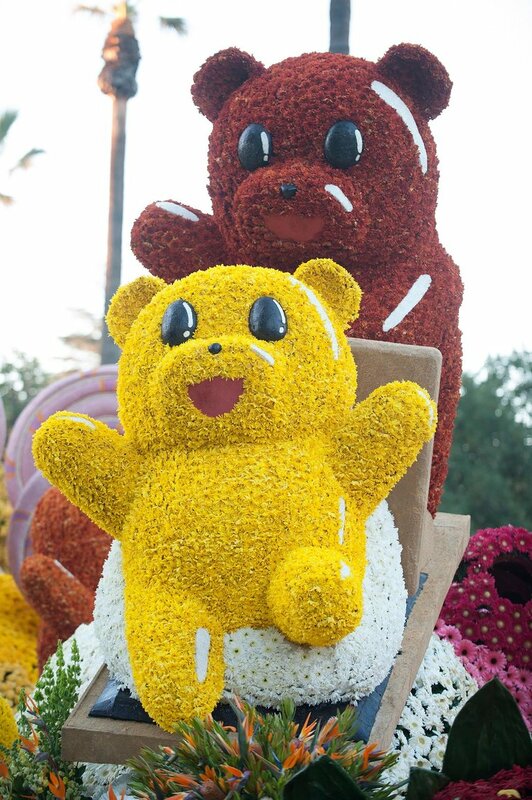 “Sweet Shenanigans” celebrates the 127th Tournament of Roses Parade theme "Find Your Adventure" as larger-than-life gummy bears enjoy whimsical exploits in an ice cream landscape populated with exciting sweets. Two gummy bears ride a s'mores sled down a large scoop of strawberry ice cream, passing companions playfully engaged in a snowball fight. Below the towering waffle cone mountains and lollipop forest, one gummy bear practices ice skating while another is ice-fishing for frozen treats. At the very back of the scene, the smallest of the gummy bears waves to the crowd while playing in a ring-shaped candy swing. Animation on this year’s float includes the pitching and rolling of the sled, snowballs flying, and the ice-skating bear pirouetting about the pond. Other animations include the bear in the swing waving, the ice-fishing bear reeling in his candy catch, and flurries of artificial snow.